This is a (2CD) Set Of Paul Santisi’s Guided Meditation Titled HEALTHY DIET in MIND BLOWING 3D Sound! *These audios are great for anyone, any age and for any reason. Discussing what to expect and how to experience fast and lasting results. 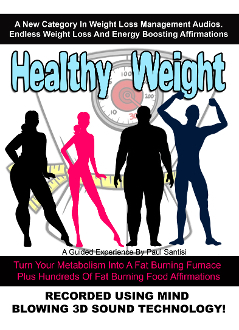 This is the full length, listen anytime version of HEALTHY WEIGHT. Countless proven weight loss affirmations that will raise your vibrations about how you look and feel about yourself. In addition to that enjoy hundreds of foods that will turn your metabolism into a fat burning furnace. This audio is unlike anything that you have ever heard before. You will love the results that you experience! Make sure to wear headphones as this is recorded in mind bowing 3d sound. NOTE: File is a ZIP FIle. Download to a computer first and unzip or use an app that can unzip files.